ONLY Gallery Magic® allows you to adjust the frame location in any direction a tiny amount micro amount or up to 3 inches after you hang it so your frames are perfectly level and perfectly spaced every time. Each Gallery Magic® unit hangs a wood frame up to 15 pounds. Do you dread hanging pictures because it's going to be frustrating and you're going to make lots of holes in the wall? When you're finally finished, is there one frame that still isn't perfect? Gallery Magic® magnetic picture hangers solve these problems because it allows you to easily ADJUST THE LOCATION OF YOUR FRAME IN ANY DIRECTION AFTER YOU HANG IT! No measurements needed so leave the tape measure in the tool box! To get the perfect location, use your hands to adjust the frame in any direction either a tiny amount or a big amount up, down, left, right or diagonal a little or a lot to get it exactly where you want it. - Tilted artwork - the frame stays where you put it! It's designed and made in the USA so you can trust it. 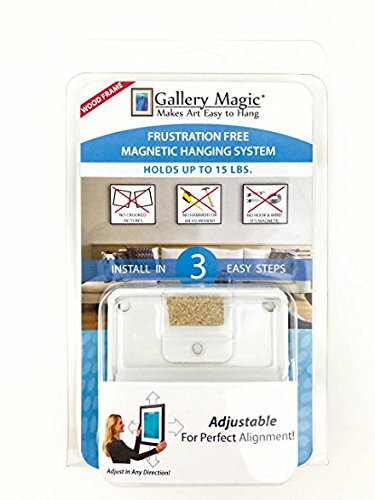 Contains 3 Units of Gallery Magic® Picture Hanger for Savings!!! Adjust the frame location with your hands AFTER YOU HANG IT. No tools needed! Featured on HGTV, DIY Network and Today Show! If you have any questions about this product by Gallery Magic, contact us by completing and submitting the form below. If you are looking for a specif part number, please include it with your message.